What is the Mohs scale? 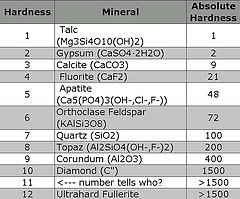 A scale that compares hardness of gemstones and minerals. What the Mohs is not? It is not a scale that weighs gemstones and minerals. The property of hardness is one of the most important properties of gemstones and minerals, especially important if you invest in jewelry and gemstones. The relative hardness of the mineral is of enormous value to the gemstone cutter, the gemstone setter, the wearer of jewelry and for everyone considering investing in antique jewelry, 20th-century jewelry and pearls. Discover the Meaning of Gemstones. What Are The Diamond Facts? Viennese mineralogist, Frederick Mohs (1773-1839) first developed the comparison chart in the early 1800s that compare the relative hardness of ten easily accessible minerals. 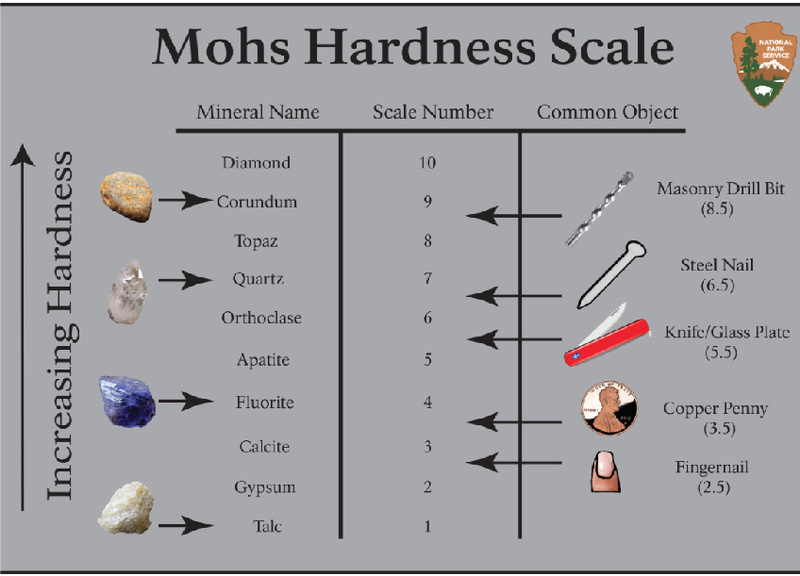 He introduced the term scratch hardness and set up a comparison scale using ten minerals of different degrees of hardness (Mohs' hardness scale) which is still widely used. The hardness of a material measures how tightly the atoms are held together within it. This test is done either by scratching one substance with another and using the Moh's Scale. On the Moh's Scale, diamond is ranked 10 and graphite is ranked between 1 and 2. This suggests that diamond is about 40 times harder than graphite. All gemstones known to us today are allocated to Mohs hardness scale. The comparison chart begins with talc which is 1 on the Mohs Scale and is the softest of the 10 gemstones. The Mohs' hardness scale works up to diamond which is ranked the highest at 10 on the hardness scale. A girl's best friend is also the traditional wedding anniversary gift for couples celebrating their 10th wedding anniversary. Ranked in order of their hardness the ten gemstones in which those minerals of higher numbers will scratch the minerals with lower numbers. It just makes common sense - right? For instance, a diamond at 10 on the Mohs scale will scratch a sapphire that is 9 on the hardness scale. Rubies and Sapphires are members of the corundum family in the list of gemstones. Diamonds may be next door to sapphires on the hardness scale, but they are not as close in hardness. That's why the Mohs Hardness Scale is the relative hardness scale. It only shows which gemstone is harder than another one. Although a diamond at 10, will scratch a ruby or a sapphire at 9, diamonds are four times the hardness of rubies and sapphires. One of the reasons why Mr De Beers says, Diamonds-are-Forever, is because diamonds are the hardest gemstones on the Mohs' Scale. They really are forever! The following numeric helps to remember the scale. Applying the knowledge Mohs hardness scale will help extend the life of your jewelry. Knowing the hardness of your gemstones will help you know how to clean and store your gem-set jewelry. For example the luster of gemstones of the Mohs' hardness below 7 can be damaged by - Dust! Some gemstones, like organic gems like pearls, and antique shell cameos are allergic to dust. Dust contains tiny particles of quartz, that is ranked Mohs' hardness 7 and is the number 1 enemy of jewelry and gemstones. Overtime the scratching of this Quartz Dust may cause the gemstones to become dull and lifeless. Such stones below Mohs hardness 7, must be carefully handled and stored. These stones should never be stored with gemstones above Mohs' hardness 7 as they will scratch them. Store these gemstones in a dust-free environment. Schumann, W., Gemstones of the World, Newly Revised & Expanded Third Edition, Sterling Publishing Co., Inc. New York.